This is a very positive message and it's great the leadership of this Mosque is so open to community interaction. However, there are many anti-Islamic and disturbing comments on the CBC, apparently from local displeased residents who make it very clear that even the Mosque being a symbol of peace, they do not like Muslims or Islams. On the good side, there are many tolerant people in the same region who respect and appreciate the significance of a Mosque like this. It appears the anti-Islamic rhetoric is on the way out and is mainly being supported by people with religious motives and who are simply copying the hate content from various sites dedicated to the hate and destruction of Islam. 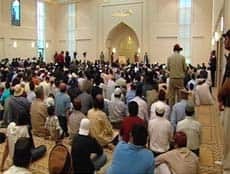 Hailing it as an "architectural treasure," Prime Minister Stephen Harper joined hundreds of guests as the biggest mosque ever built in Canada opened its doors on Saturday. 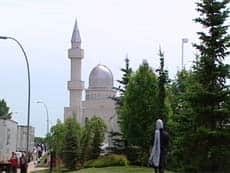 The $15-million Baitan Nur mosque in northeast Calgary covers 4,500 square metres, or 48,000 square feet, and was constructed largely through donations from the city's small but rapidly growing Ahmadiyya Muslim community. "I don't suppose I will be the first to observe it isn't exactly the little mosque on the prairie," Harper said. "Quite the opposite. It is Canada's largest mosque complex." Harper was joined at the opening by several federal and provincial politicians, including Liberal Leader Stéphane Dion. "This community knows first-hand what it is to experience persecution and discrimination based on your religious beliefs," Harper said following a tour of the sprawling mosque complex. "So you understand at a profound level that promoting religious freedom is an essential building block for peace and stability here and throughout the world." Members of the community say the stunning architectural landmark will serve as a symbol of peace. "We are inviting people of other religions to come to us and talk," spokesman Safeer Kahn said during a media tour on Friday. "We don't want to isolate ourselves. We want other people to come and tell us about their teachings and their [religious] scripts ... and they will listen to our positive views," he told CBC News on Saturday. The mosque is a sprawling but spartan building, designed to allow women and men to worship equally. "Whatever is available to men is available to women," Kahn told reporters. "In this hall, we made many skylights," he pointed out during the tour. "The name of the mosque is Baitun Nur, which means house of divine light." A few hundred people from the city's Ahmadiyya Muslim community of roughly 1,500 raised $8 million for the mosque's construction. One of the contributors, taxi driver Ijaz Ahmad, said he sold his house and moved his family into a basement apartment in order to donate $100,000. "Children broke their piggy banks, people sold their houses, they donated the money and moved to basements, some people obtained second mortgages," Khan said at Friday's dedication ceremony. His Holiness Hadhrat Mirza Masroor Ahmad, spiritual head of the worldwide Ahmadiyya Muslim community, delivered the opening sermon, broadcast Friday to 170 countries via Muslim Television Ahmadiyya (MTA) satellite service. He said such mosques should not only enhance the local landscape but promote mutual peace, love and harmony in society.